Thirty years ago, you couldn’t find a 15 year-old teenage boy who wasn’t counting down the days until he could get his driver’s license. Today, large numbers of teenage boys (and some teenage girls) just don’t seem to be interested in getting their drivers licenses and in fact, many parents are forcing them to take driving lessons against their will. Why does this happen? After teaching thousands of teenagers to drive, I’ve discovered that the teenagers, the ones that really don’t care about a getting a driver’s license, are almost 100% of the time videogamers. But it’s not limited to just videogamers, teenagers who spend a great deal of time on computers, smartphones, and gameboy type of devices are usually just as reluctant to learn how to drive. To explain this situation, I’ll borrow a little information from my new 5StarDriver.com Video Driver Training Program. We have two types of vision, peripheral and direct. Direct vision is the highly focused narrow part of your vision for sharp detail while peripheral vision is the non-focused wide part of your vision covering about 170° – 180° of the area ahead. Peripheral vision is also used to detect motion. The problem arises from the visual search pattern created by constantly looking at electronic screens. All electronic screens have borders, 100% of the information presented is confined within the borders of those screens while 0% of the information is presented outside of the screen border. Playing videogames for years and staring at screens for long periods of time, these teenagers develop a hyper-focused direct vision while completely shutting off their peripheral vision (how many times have you walked into a room where someone was playing a video game and they didn’t see you when they should have?). The pattern of only looking straight ahead while completely shutting off peripheral vision creates a dangerous visual search pattern for driving. When one of these tunnel vision videogaming teenagers gets behind the wheel for the first time, most parents and driving instructors are completely scared and baffled as to where they should begin because there seems to be no control or common sense by the new teenage driver whatsoever. The new teenage driver stares straight ahead (like they’re looking at a videogame screen) without turning their head or moving their eyes side-to-side. 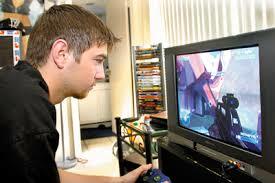 In videogames, the picture on the screen moves to the teenager’s eyes. In driving, the teenager’s eyes must be trained to move to see the picture. I’ve retrained many students after they’ve tried and failed to learn at some of the cheap driving schools so please, if a driving instructor ever says your teen can’t learn, it may be that he doesn’t have the skills to teach them. Don’t be discouraged, find a competent instructor or learn how to do it yourself through the 5StarDriver.com program. The cure is to change the visual search pattern of the new driver. The new driver is attempting to drive only by their hyper-focused direct vision as their peripheral vision has been effectively shut off. These new drivers have peripheral vision, they just don’t trust it. Accomplished drivers use and trust their peripheral vision to know how far they are from another vehicle or maybe a bicyclist without having to look directly at them. Our peripheral vision “detects motion” and “lack of motion”, an incredibly important “problem detector” necessary for survival while sitting behind the wheel. However, when a driver doesn’t trust their peripheral vision, they resort to putting their direct vision on the vehicle or bicyclist often resulting in steering towards those things. I am not a big fan of videogames because of the extremely dangerous effects they have on new drivers. If driving wasn’t the #1 killer of teenagers and if eighty percent (80%) of new drivers weren’t involved in a traffic accident in the first 3 years, then I might have a different opinion. I encourage parents to mothball the videogames and get your teenagers outside doing activities that will enhance the trust of their peripheral vision. When a teenager crashes in a videogame, they hit the reset button without any consequences. When a teenager crashes while sitting behind the wheel of a real vehicle, there is no reset button, only consequences. Please check out my new 5StarDriver.com Video Driver Training Program and make sure your new teen driver is a 5 Star Driver. This entry was posted in Uncategorized and tagged Accident Prevention, Distracted driving, Driver Education, Driver Training, Driving School, Home Schooling, Parent Driving Instructor, Safe Teen Drivers, Teen Drivers License, Teen Driving, Traffic Accidents by admin. Bookmark the permalink.